As members of Supportworks, the nation's largest network of independent foundation repair contractors, Supportworks of Central Iowa offers services and products unparalleled in the industry. 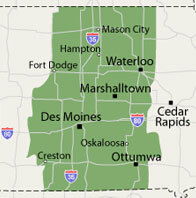 Supportworks of Central Iowa is a division of Midwest Basement Systems. Since 1995 Midwest Basement Systems, Inc. has helped clients with their foundation issues -- in both new and existing structures, as well as basement waterproofing and crawl space repair projects, plus commercial and residential foundation projects. Midwest Basement Systems has been an installer of wall anchor systems since 1995 and foundation support piers since 1998. We currently maintain a staff of 10 knowledgeable representatives who specialize in designing foundation stabilization solutions for commercial, industrial, municipal, governmental, and residential clients and have 10 installation crews on the job every day. 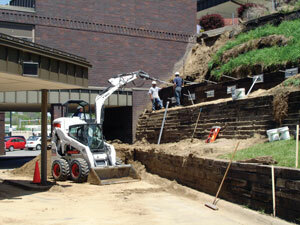 Supportworks of Central Iowa completes about 1,300 commercial and residential projects annually. Midwest Basement Systems, Inc. was recognized by the Better Business Bureau in 2010, and was honored with the Business Integrity Award and maintain an A+ rating with the BBB. As local contractors in the community, we feel a special responsibility for our clients. Each job site is just a short drive away, so we're able to arrive whenever you need us. We understand that issues can and do arise during construction, and revisions may need to be made mid-stream to accommodate design changes, account for unexpected soil changes, make room for unearthed foundations, or for other reasons. Midwest Basement Systems has the experienced field personnel and office staff to help you work through those issues. We are totally committed to doing the job right and to being prepared for anything.